Last Thursday while I was attending the ABA Labor & Employment Law Section meeting, the U.S. Department of Labor Wage and Hour Division, issued an advisory opinion letter, FLSA 2018-17, that amends previous guidance regarding the “tip credit provision,” sometimes known as the 80/20 rule. The “tip credit” provision addressed the payment of minimum wage and applies to employees of a business that usually receive at least $30 per month in tips. These “tipped employees” are not required to be paid federal minimum wage (currently $7.25 per hour), but instead, only $2.13 per hour. In 2011, the Department of Labor had issued an opinion rescinding a 2009 opinion and instituting what has colloquially been called the “80/20 rule.” By FLSA 2018-17, the Department of Labor fully reinstated the prior 2009 determination, which will have far reaching consequences for employers of “tipped employees,” in the restaurant industry. In order to understand this change, it is important to understand the old 80/20 rule. That rule is illustrated by the following example: A server primarily engages in the act of serving customers, or a “tip-producing” occupation. However, the server may engage in other work that does not directly generate tips, often called “side work.” This side work may involve folding napkins, wrapping silverware, cleaning tables, and similar tasks. The 80/20 rule, at its core, mandated that if such “non-tipped” tasks exceed twenty percent (20%) of an employee’s duties, the employer would not be able to use the “tip credit provision,” and could be required to pay the employee minimum wage. This led to numerous claims by employees that an employee’s collateral duties exceed twenty percent of the employee’s working time and demands that an employee be paid full minimum wage. The rule turned into a nightmare for the small business. Last week’s new guidance from the Department of Labor undoes the 80/20 rule. Now, there will be no limitation on the amount of duties that do not directly produce tips, provided they are related to the tip-producing occupation, and are performed contemporaneously with direct customer service or “tip-producing” duties, which would include folding napkins, wrapping silverware, cleaning tables, and similar tasks. Note that this would not apply to employees who engage in dual occupations, rather than those who complete some non-tipped work related to an employee’s customer service duties. For instance, the opinion letter cites the example of an employee who performs both duties as a waiter and a maintenance man. 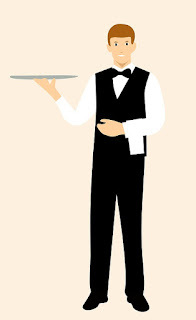 The employer is not entitled to take the “tip credit” for the time that the employee works as a maintenance man, because this is not a “tipped” profession. The opinion is limited to work performed that is related to the “tipped” profession. Also, be advised that this determination applies only to federal minimum wage standards. Certain states and localities may have different laws and regulations concerning minimum wage. Common Sense Counsel: Other than Tipped Employees, there are several FLSA Compensable Time Issues That Can Trip You Up Big Time! The FLSA clearly defines what qualifies as compensable time. Do the following count: Waiting time, On-call time, Rest and meal periods, Sleeping time, Lectures, Meetings and training programs, Travel time, Meal time, after hour emails/text messages? Problems occur when employers fail to have legally defensible handbook policies, employee sign-offs and notices, and supervisors trained to recognize and count certain hours worked as compensable time. Getting it wrong can be costly. Tommy Eden is a partner working out of the Constangy, Brooks, Smith & Prophete, LLP offices in Opelika, AL and can be contacted at teden@constangy.com or 334-246-2901. Blog at www.alabamaatwork.com.